A Catholic parish in a posh area of the Philippine capital's business district, Makati, has drawn flak for proposing to charge more than US$1,000 for weddings held in the parish church. A barrage of social media posts has condemned Santuario de San Antonio Parish in Makati’s exclusive Forbes Park village for raising its wedding rates from about US$767 to US$1,250. The parish church has slots for 936 weddings each year. Of US$1,000 for every wedding held, the parish gets US$936,000 or about 490 million pesos a year. 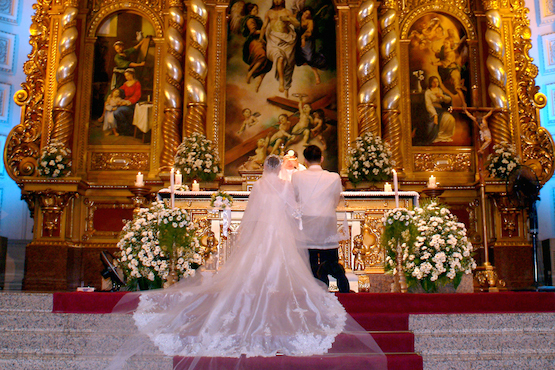 Most churches in the Philippines charge a wedding fee of about US$100 to US$400. Special discounts are also given to parishioners, or if couples decide to hold their wedding on a weekday. Air-conditioned churches charge extra to cover electricity and other operational costs. Santuario de San Antonio Parish also announced on March 15 that it would raise annual accreditation fees for wedding planners, florists, musicians, videographers and photographers. The parish also planned to charge wedding planners an annual accreditation fee of as much as US$1,000 while photographers and videographers would be charged at least US$575. Wedding blogger and photographer Dominic Barrios said the new rates are "excessive." He said those getting married in the church will be burdened because they will pay for the suppliers. Parish priest Reu Jose Galoy, a Franciscan, immediately withdrew the new rates following the slew of criticism. "We apologize if the regulations and the rates caused you all concern as it was never our intention to do so," said the priest in a statement released by the parish. He said that "while we feel the regulations ... were fair and well thought out, we now realize that they should be considered a work in progress rather than the final product." The new regulations and rates for weddings were presented during the parish's first "wedding congress" held on March 15. Father Galoy said the parish would review the concerns raised by the public and consider all suggestions to arrive at "a sensible set or rules that would address the interests of all concerned." Barrios and other "wedding suppliers" welcomed the priest's announcement, adding that they are willing to help out and give some input about the new rules. "The good news is they heard us," said the photographer. In 2014, Pope Francis condemned priests and lay people who turn their parishes into "businesses" by charging for baptisms, blessings and Mass intentions.